First impressions matter. Especially in your emails. You only have a few seconds to grab someone’s attention and your opening line can often make the difference between getting read and getting deleted. How many times have you clicked open an email to read, “I hope you’re doing well,” “FYI…,” or “Read below”? [Mutual contact] recommended I get in touch with you. How did your [recent project] turn out? Did you enjoy your [event or vacation]? I loved your recent [photo/article/social media post]. I was just laughing the other day about [inside joke]. I was just thinking about you and [shared memory]. It was fantastic to see you at [event]. This [article/video/GIF] made me think of you. Good news—there’s only [number] more days until Friday. Hope you’re surviving another work week. I hope you’ve had your coffee already. Just what you wanted—another email! It looks like my last two emails must have missed you. Checking to see if you received my last email. Keep in mind, not every opening line is appropriate. Ask yourself what you’d say if you were calling on the phone. You should rarely ever write something you’d be embarrassed to say. Hope these help get you started. 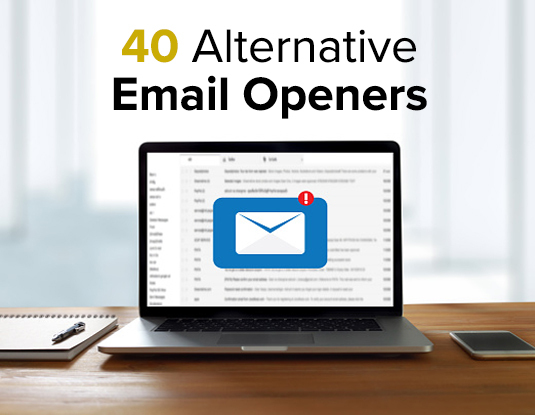 Based on 40 Email Opening Lines That Are So Much Better Than “Happy Monday!” by Kat Boogaard.